What kind of henna do you like best? I have a henna offering for many of the special events, changes and celebrations in a woman's life and Henna for fun. I love abstract, asymmetrical - symmetrical designs, as well as objects, like trees, animals & nature. Ideally when creating a design, my subject & I partner in selecting various elements, how they interact and their significance. When looking at the body of my work it is east to see similar parts or flavors between past design, it is un mistakenly clear, each is completely unique & personal. The place to start is where (on you) and why are you getting tattooed; click on a picture (below), a panel will appear below, see what designs women created and get more details, plus a link to signup for your own (or someone you love's) Henna Pampering & Commemorative Photos, with SarahKate. 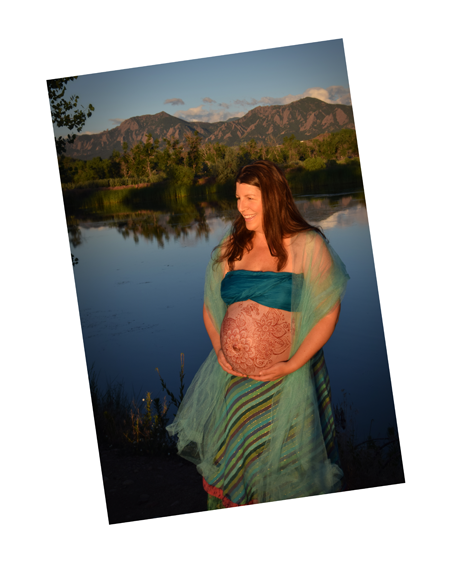 Making the decision to become a parent is a wonderful choice to be celebrated! 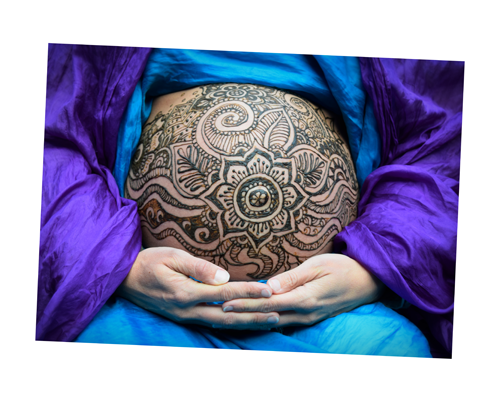 A henna pampering session honoring pregnancy begins with selecting design elements that move you, and I will create an original design spontaneously for you. If you let me know your design ideas ahead of time, I am happy to do some artistic research to find some unique ways to represent the elements you have in mind. Recline in my special chair in my home studio to be adorned with sweet smelling henna, with medicinal properties that include being soothing to your nerves. The process usually takes about 2 hours and includes photographs when you are freshly painted as well as when the henna is peaking in color ~ 2 or 3 days later. I love to create unique designs for women and I am happy draw one up that suits your vision. I do not do the actual permanent tattoo, instead I sell you the art to bring to your tattoo artist. These sessions include a brief appointment (20 minuets) or phone call to discuss your vision and a digital copy of the unique design for your use. Permanent tattoo designs begin at $120 with design, all rights to the design art and the art on a file to be printed. Body art can be such a joyous way to celebrate the special moments in your life ~ getting married, birthdays, coming of age, romantic henna or even just feeling like a goddess! It can also be a way to test out an idea for a permanent tattoo. 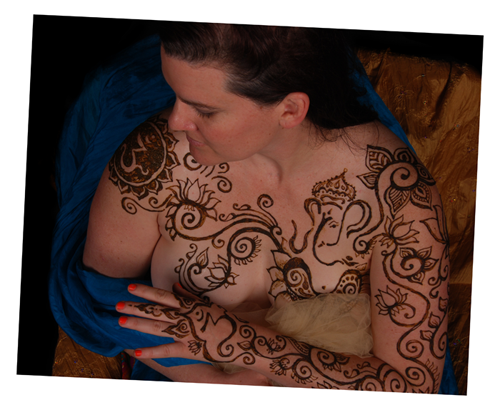 These sessions are totally private in my henna studio, where you'll guide me in your vision of the design. 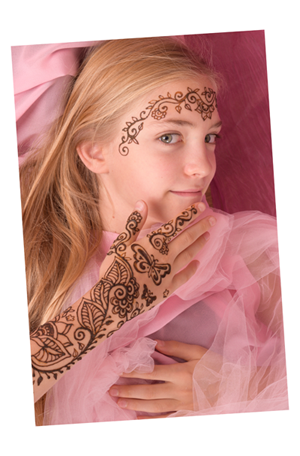 Henna & photography sessions include 90 minuets of henna adornment. What a unique way to come together and celebrate family! 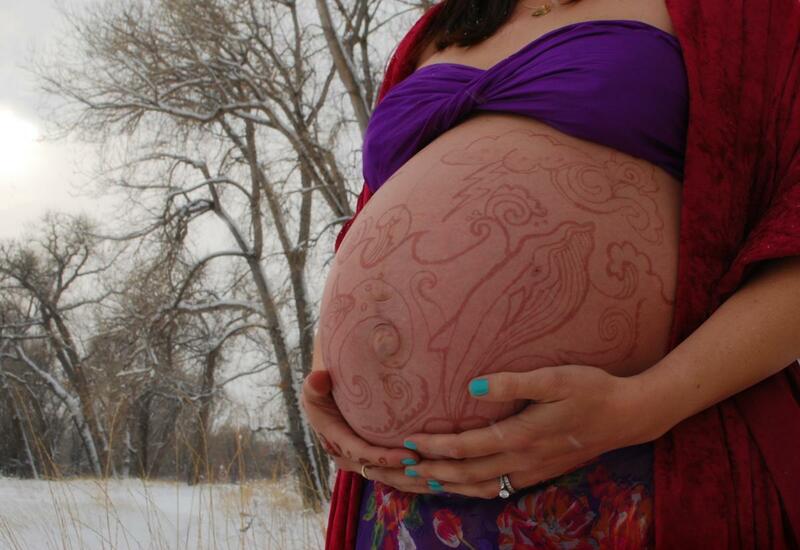 Whether it's just you and your daughter or 3 or 4 generations, body art can be a really fun way to celebrate. We'll begin with a design theme of your choosing and adorn everyone's hand(s) / arm(s) / feet ... whatever you'd like! 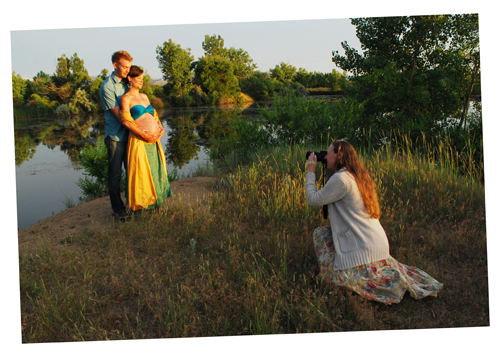 Henna and photography packages include 2 hours of henna adornment. 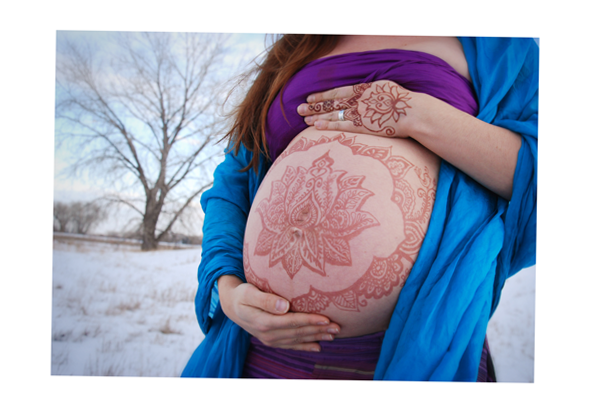 Postpartum Henna Pampering can stand alone or be part of a Pregnancy + Postpartum Henna Pampering package. 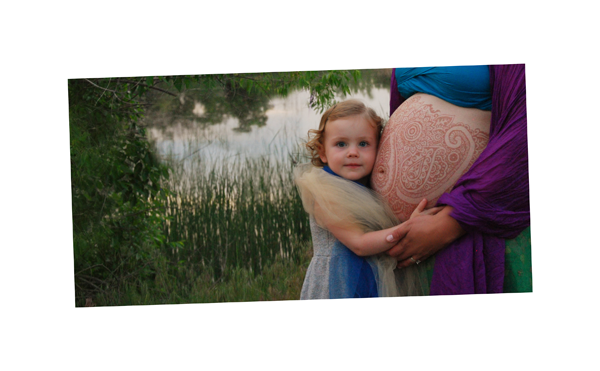 For mamas of new babies, we are happy to come to you for the Henna pampering and photographs. 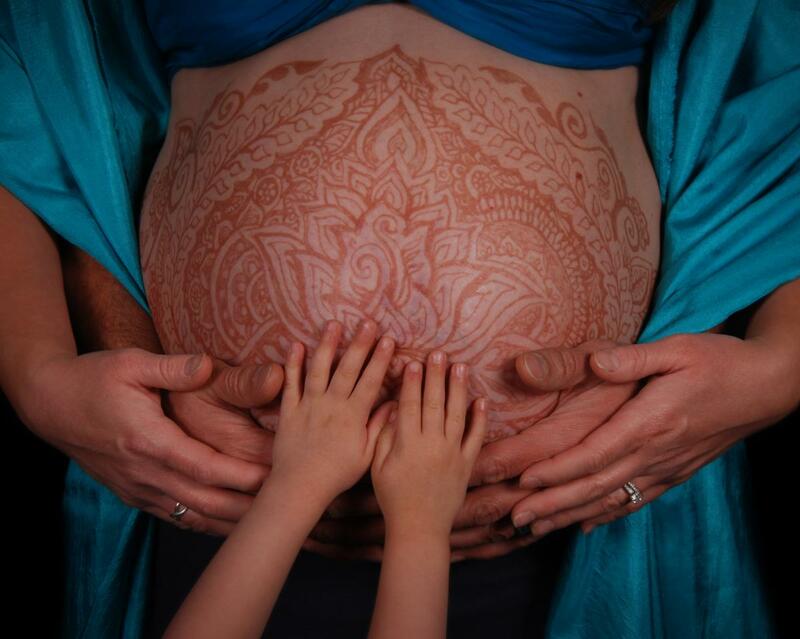 Postpartum Henna Pampering starts, with the development of your design and where you are going to want me to paint you. 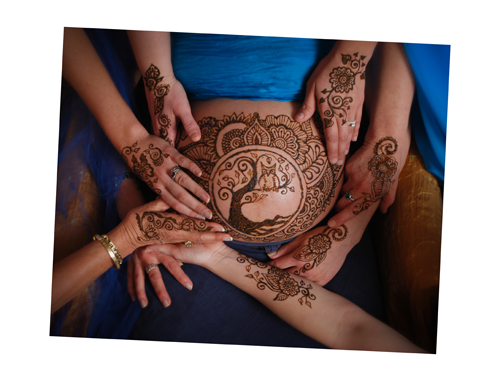 Women who've had Pregnancy Henna with me, often wish to continue a design, or we work together to create a new special design, just for you. 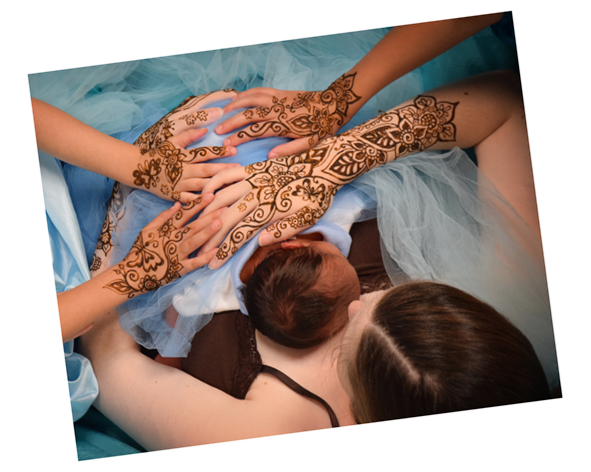 Postpartum Henna is normally for the hands, hands all the way up, as a sleeve and we can do your feet which feels great and is really fun. 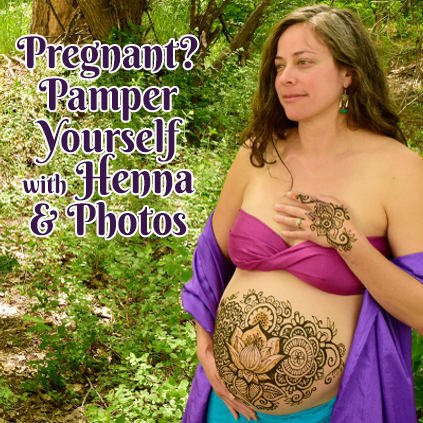 When it comes to painting shoulders or near breasts I have an offering Henna Papmering for Nursing Mamas which is more suited for a little older babies who can go without nursing for more that 3 -4 hrs while the henna dries. 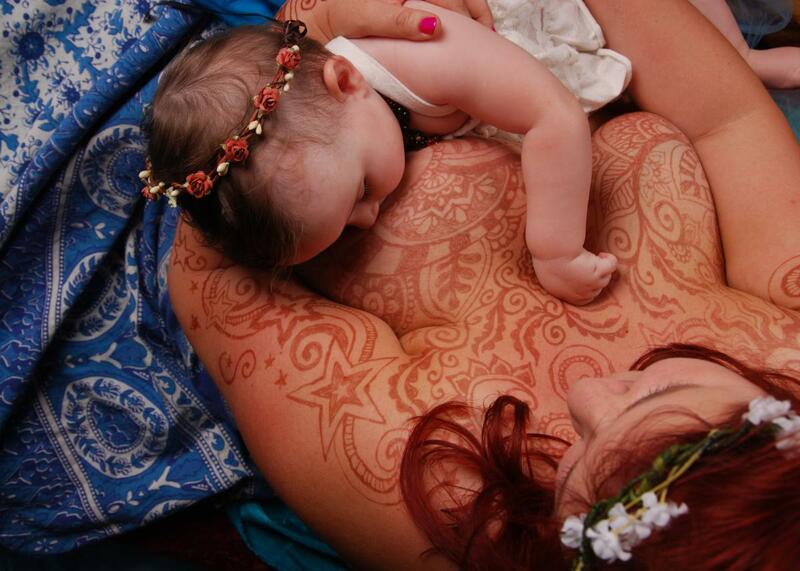 Breastfeeding Henna Pampering is a fun way to celebrate the special bond developed during this brief time. 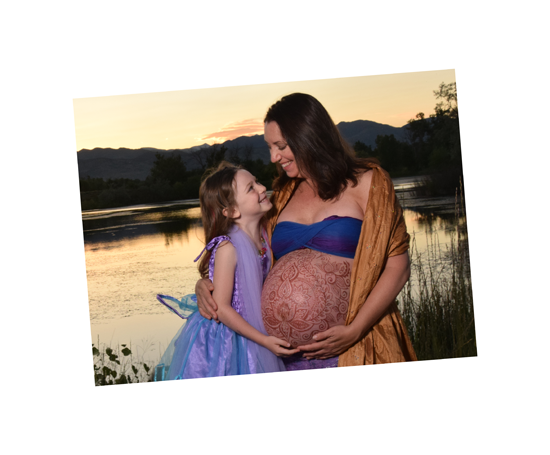 Nursing is a unique relationship, shared between mother and child(ren), it is clearly obvious that this relationship is at best misunderstood by some people. 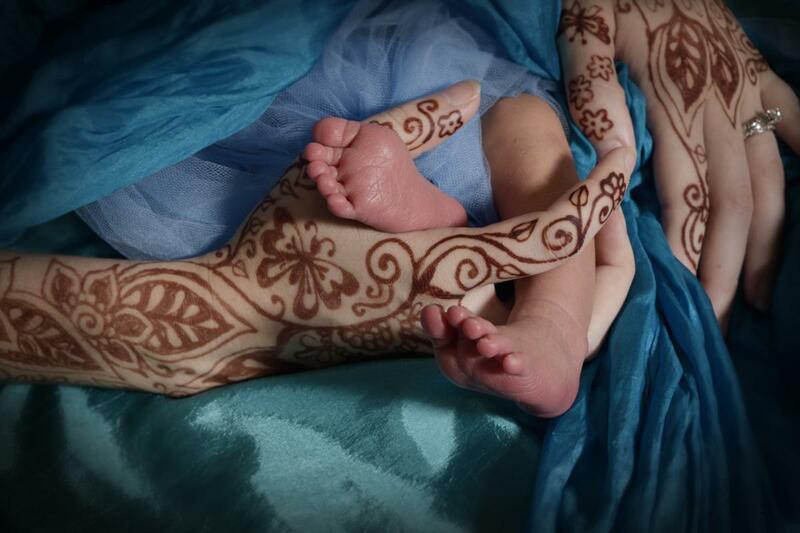 For mamas of new babies, we are happy to come to you for the Henna pampering and photographs. 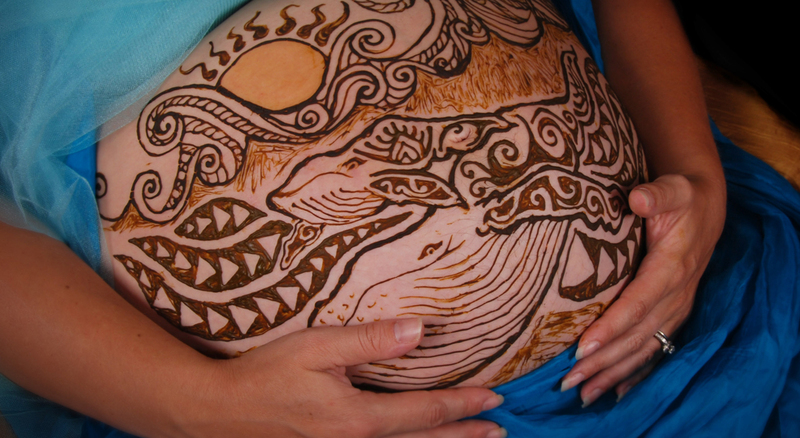 Breastfeeding Henna Pampering starts with the development of your design and where you are going to want me to paint you. 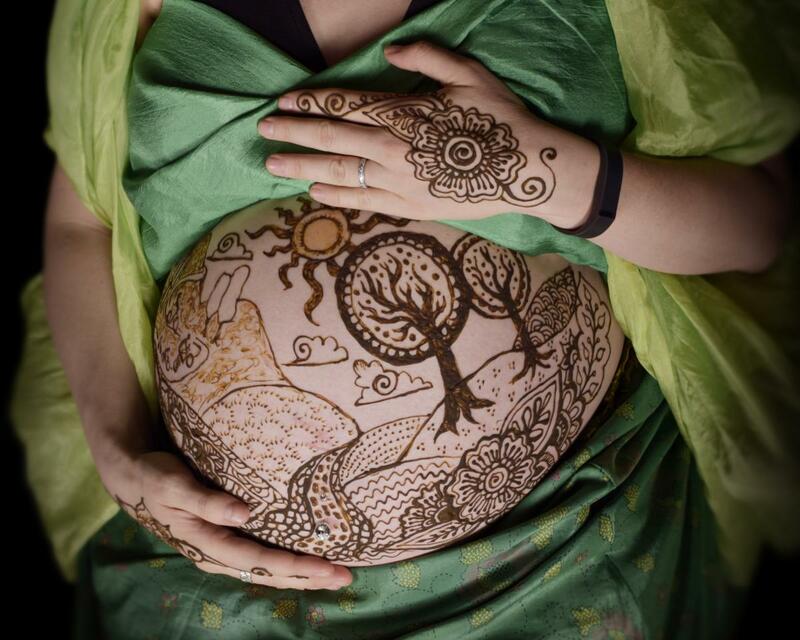 Women who've had Pregnancy Henna with me often wish to continue a design motif, or we work together to create a new design. The painting takes about 2 hours, and then the paste needs to sit on your skin for 4 to 6 hours ~ without being picked off by your baby. Breastfeeding Henna is more suited for a little older babies who can go without nursing for more that 5 hours while the henna is applied & dries. Henna parties can be a tremendous amount of fun! 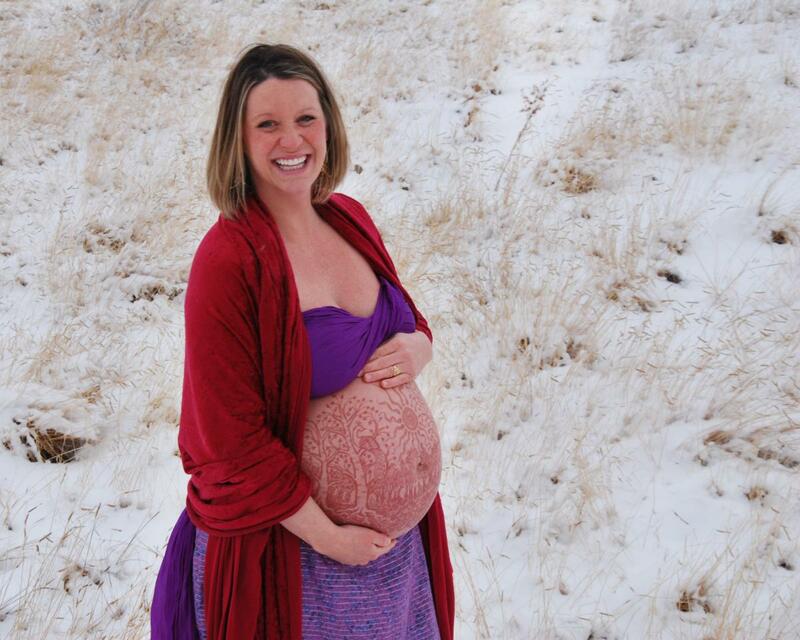 It's an opportunity for women to gather together and celebrate ~ pregnancy, bridal showers, birthdays, coming of age, etc. What a great party favor! I am happy to host gatherings in my home of up to 10 women, or travel to your location to adorn the guests in your home. Henna parties last 2+ hours, and in 2 hours I can adorn 3 girls arms (such as in the photo to the left), or I could do small designs for 50 people. When I go to a baby shower to adorn a mama and her friends, it can take 2 to 3 hours, depending on how many guests and the size of the tattoos. Henna parties include 2 hours of adornment. Women are welcome to return for photos 2 or 3 days later when the henna is peaking. What a great pick-me-up, starting with a relaxing Henna Pampering session and going into feeling beautiful, looking beautiful and having photos to remember this special time. What are people saying about SarahKate? Thank you, thank you SarahKate!!! These photos are beautiful! You are a truly gifted artist!! 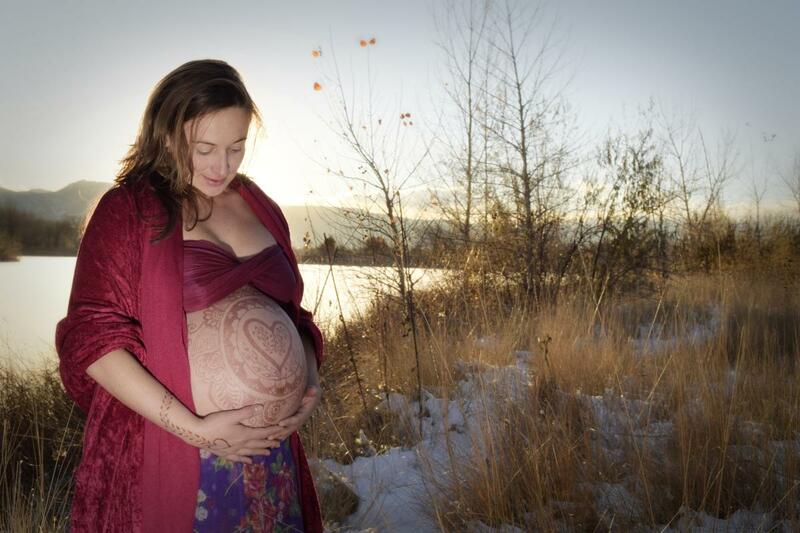 You really captured Ella's sweet pure nature perfectly and with the henna...I love it!!! ...thank you for working with me and my family, my girls were enamored by your daughters and still talking about our experience. the magic of the henna continues to unfold and am feeling empowered by the experience. I just wanted to express a large amount of gratitude to you and your husband. We had so much fun last night! I am really excited to see the pictures! It has been such a joy to share the beautiful henna artwork with my family and friends. 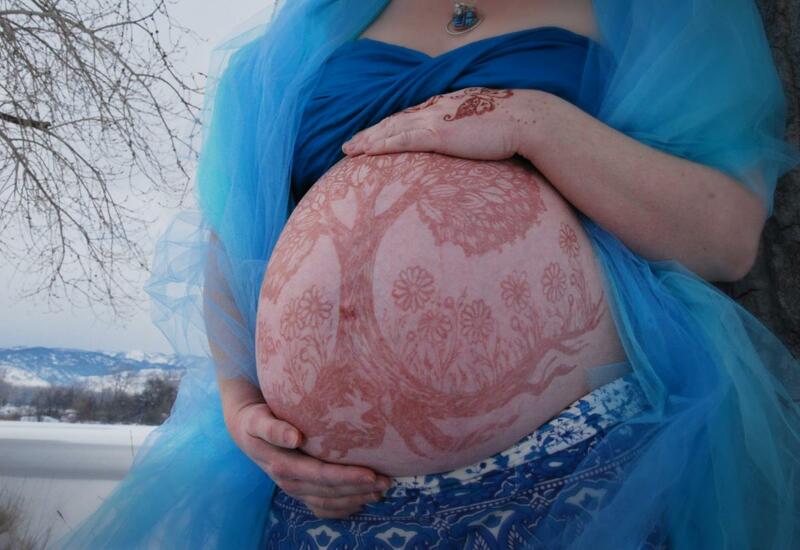 Being adorned with henna has transformed the way I feel about my blooming belly. It instantly made me feel more feminine and beautiful. Thank you so much for everything. I will always look back at these memories with great happiness. 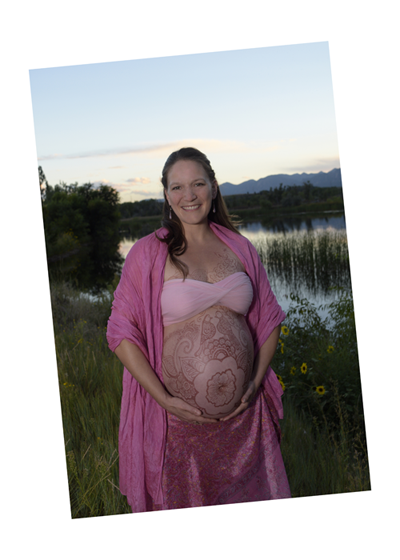 Thank you SarahKate Butterworth for this most nourishing and sacred artistic experience...love your work, love your heart, love your vision, and especially your humble offering to pregnant mamas in our community ~ helping us feel empowered and beautiful in our full, abundant, changing bodies - you are a true gem amongst us! Thank you for helping me to embody the Mother Goddess for the powerful Fire of the Goddess ritual and beyond...I know this experience and these records of your art will continue to serve as a precious resource for me as I deepen into this transition into Motherhood....and most importantly, my baby felt mama relaxing, feeling peaceful, and taking in the potent medicines of rich self-care, play, adornment and self-love- baby is so fed as well! the sweetest blessing of all!